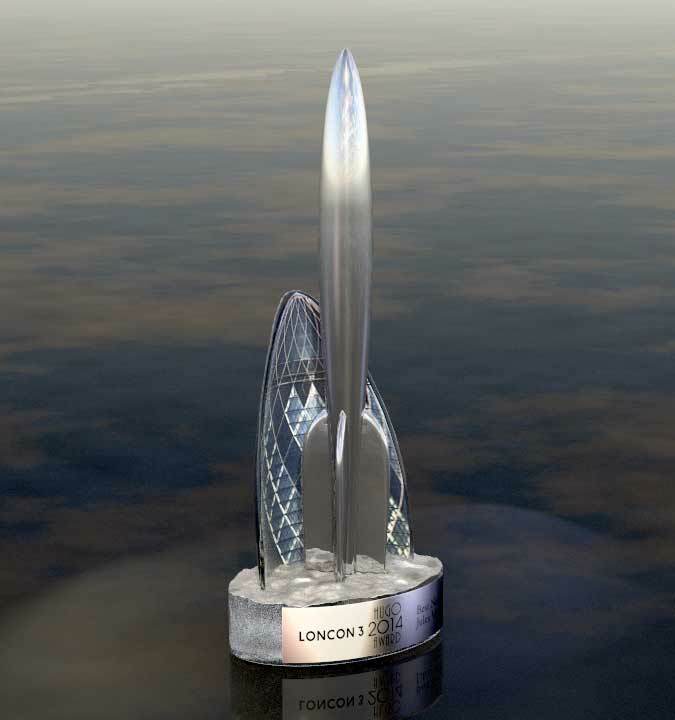 In honor of Jules Verne, and in keeping with the 75th Anniversary theme of Loncon 3, the 2014 Worldcon, the 2014 Hugo Award base is a small sector of the lunar surface upon which the rocket has touched down; just in front of the very recognizable 30 St. Mary Axe  otherwise known as "The Gherkin Building", due to its unique profile. The sculpture base is a solid cast glass oval; approximately 2" x 6" x 4" (5cm x 10.16cm x 15.24cm) weighing approximately 2.75 lbs. (1.25kg). The surface "dust" and craters are sculpted white and light grey glasses over the clear solid crystal base. The building section is .25" (6.35mm) thick multi-colored fused and molded glass, approximately 1.625" x 4.25" x 7" (4.13cm x 10.8cm x 17.78cm) weighing .625 lbs. (283.5 g), etched with the characteristic diamond pattern of the building's structure. 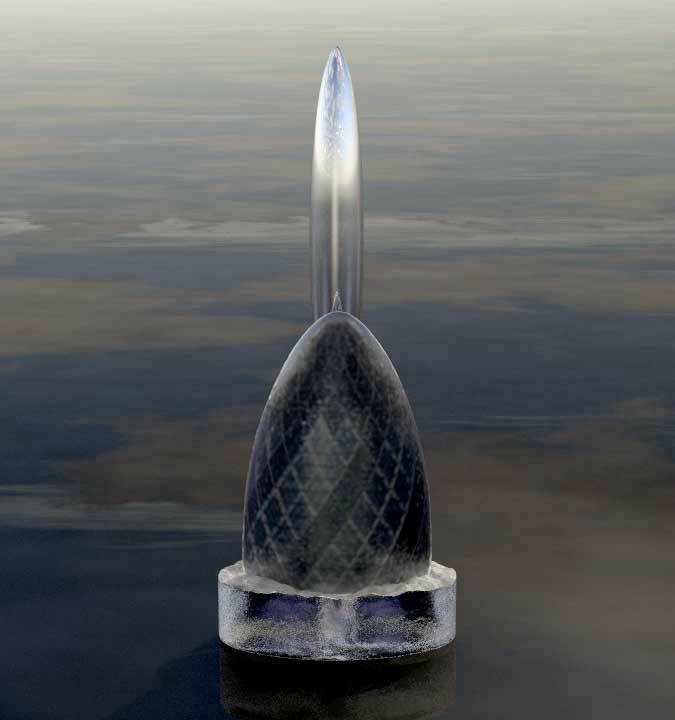 Note that, due to the shell cross-section and nature of a transparent medium, when viewed from the back the pattern will appear to be reversed. Think of it as seeing the building from the inside. The rocket is attached with a standard 5/16-18 x 2" socket head cap screw through a custom plastic bushing that runs the height of the base. 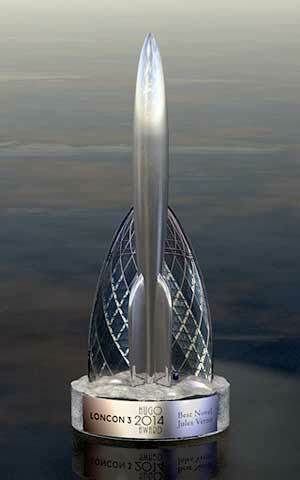 Both the rocket and the bolt are completely separated from the glass. Very snug and stable while assembled, the rocket is easily removable for safe transport. While not fragile, proper care should always be taken with anything of value. The entire glass assembly weighs 3.375 lbs. (1.53 kg), so due care should be used when lifting the award. 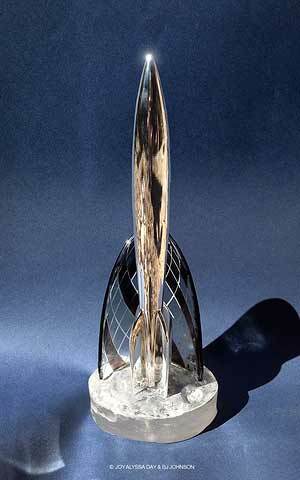 Even though it is a tempting "handle", do not lift the award by the rocket alone. If nothing else, you'll get fingerprints all over its highly polished surface. 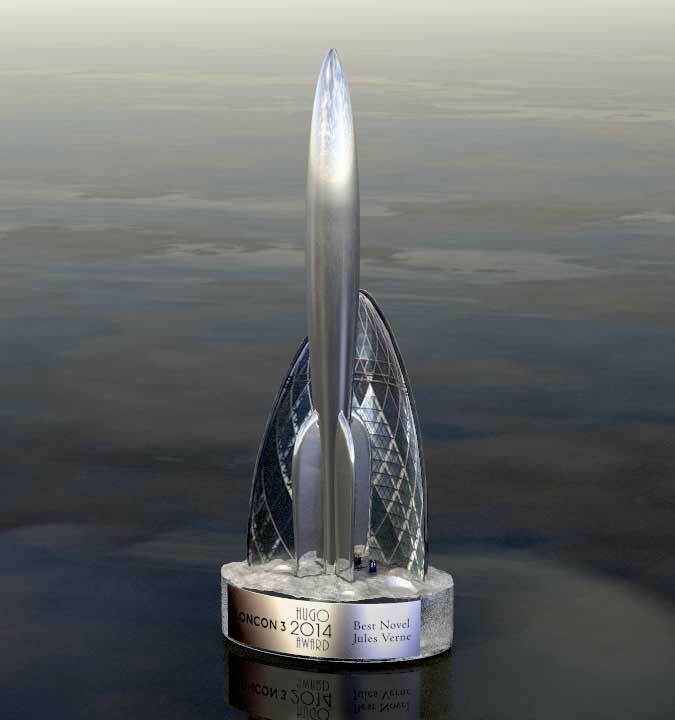 Always hold the award by its base and steady the rocket with your other hand. If you are a recipient, please consult the Assembly Instructions for detailed information and care. 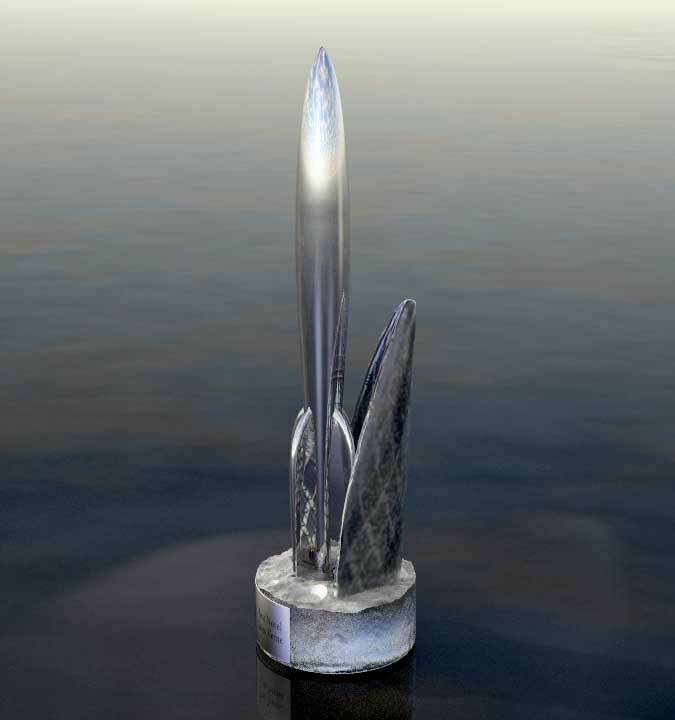 As is the case with all of our prestigious award creations, each sculpture is an individual; hand-crafted with care by experienced craftsmen. While adhering to the overall concept, the craters, dust patterns and building features will exhibit slight variations; allowing the personality that can only be born in a handmade work of art to emerge and shine through. 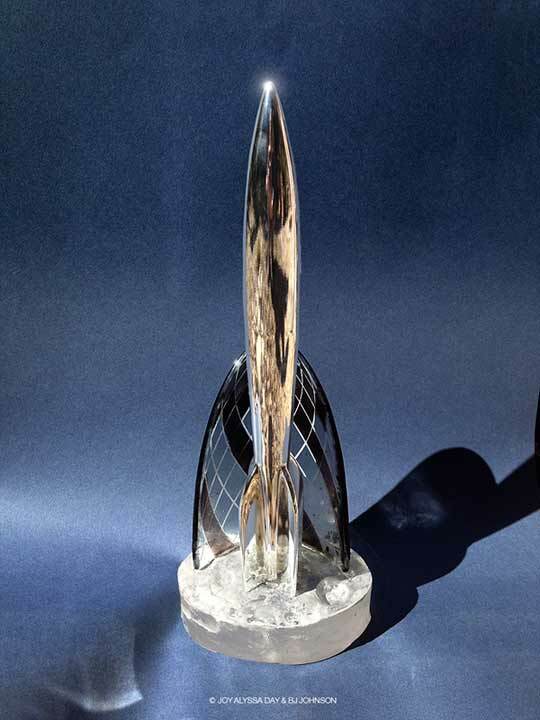 Joy and I are honored to have created award sculptures and large commissions for many great individuals over the years. 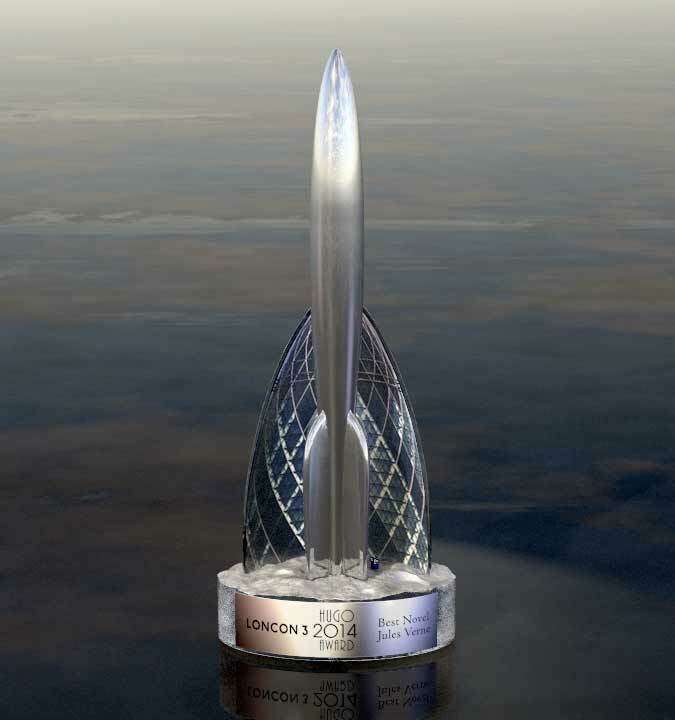 This Hugo Award stands among the best. Always thought I might win one someday. Now I havefor myself in the most special wayI actually helped create and make it. Herewith, we present our unveiling video that tells a brief visual story of who we are, what we do and, in the telling, just a hint of the seeming inevitability of this coming true. If you have hardware or an Internet connection that may have trouble with 1920x1080p HD videos, to help you have a good experience we have encoded a 1280x720p HD version that isn't as taxing.